My mother made me homemade popsicles when I was little ... I believe using Kool-Aid and an orange Tupperware popsicle mold set. 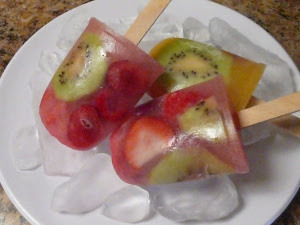 I've been making them for my children for a while now ... my kids are HUGE popsicle fans! Here are some various ways to make unique, fun popsicles and frozen treats using plastic popsicle molds. If you don't have molds, you can use small cups and wooden popsicle sticks. If you use wooden sticks, you have to wait to put in the stick until the liquid is partially frozen so the stick will stand up straight. Place a couple of scoops of vanilla ice cream in each mold (I use a melon baller), then slowly pour in root beer. Allow the foam to go down and continue filling not quite to the top of the mold (the soda will expand, so do not fill it all of the way). Freeze until solid. Use whatever fresh fruit you have ... we love using cherries, melon, kiwi, strawberries, raspberries, peaches, etc. Clean and slice the fruit(s) of your choice. It's prettiest if you can get some or all of the fruit to stick to the sides of the popsicle mold before pouring in whatever juice you plan to use ... so that the fruit can be seen easily once frozen and unmolded. After putting in the fruit, pour in whatever yummy juice you plan to use. Freeze until solid. Place one maraschino cherry in the bottom of each popsicle mold. Pour a little bit of the cherry juice over the cherry. Allow to freeze for a couple of hours until hard. Pour in peach juice and freeze until solid. This is, also, yummy using cherries and orange juice! Following the directions on a package of the pudding flavor of your choice (Mine was a 3.9 oz. chocolate package and required 1 3/4 cups of milk). Stir until well-blended and starting to thicken. Fold in 1 cup of partially thawed Cool Whip. I use partially frozen Cool Whip and don't blend completely so there are chunks and swirls of Cool Whip throughout the pudding. Place in popsicle molds and freeze until solid. Freeze a stick or two of Gogurt (yogurt tubes) until solid. Then, cut into chunks and place in bottom of molds. Pour the juice of your choice over the Gogurt chunks and freeze until solid. Blend a handful of pineapple, 2 cups of coconut milk, 1 banana (cut into chunks), a good drizzle of honey and 1 tsp. of vanilla in blender. Pour into molds and freeze until solid. Place 4 - 5 strawberry slices in each mold and pour in pink lemonade. Freeze until solid. Using a variety of juices, make layers by freezing for about one hour each time you add a new color/flavor. This can, also, be made into Jello pops by layering Jello flavors/colors. Furthermore, you can make what I call "slanted" popsicles by freezing each layer on an angle. Just prop your mold or cup on the same angle each time you put a new layer in the freezer. ... ending with freezing the top layer straight So fun! We made some with all different flavors of Gatorade. My kids wanted BIG popsicles for these, so we used cups larger than we normally would. They loved them! We didn't get around to making these for this post, but I have made them in the past and they are super yummy for those who love iced coffee beverages! So, I wanted to post the idea. This is a great way to cool down while getting your coffee fix on those hot summer days! Simply brew a pot of coffee (or use your leftovers), mix in your favorite flavored creamer (add a little sugar, if desired, if using plain milk or creamer) and allow to cool slightly. Pour into the mold and freeze until solid. You can, also, pretty much take any smoothie concoction after you've blended it and pour it into popsicle molds and freeze. Bananas, yogurt, berries, etc. 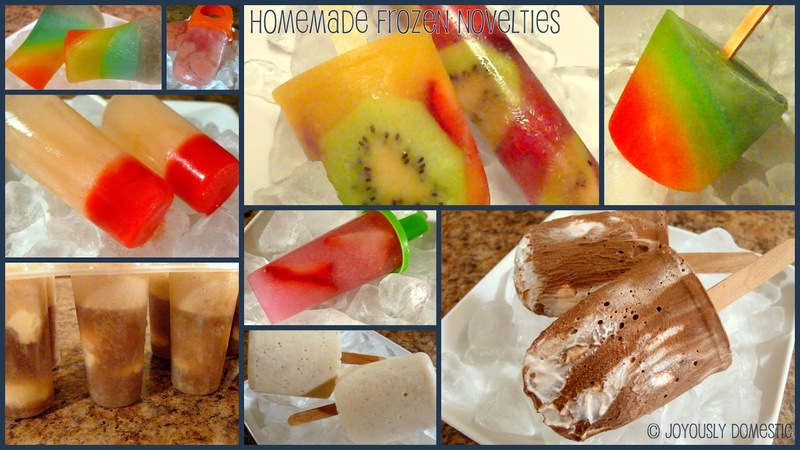 You are pretty much only limited to your imagination when making your own popsicles at home! Any juice or fruit will work ... and this is something kids really love to get involved in! Happy summer and stay cool!